This week has been full of the Chelsea Flower Show; on television every night and in the newspapers. Makes you wonder if there’s any point in actually going in person when you can see all the best bits without the expense or the hassle. It’s not an easy question to answer. You undoubtedly see much more of the outside gardens on tv than you will at the show, unless you go very early in the morning or in the evening when it’s quieter. During the day, everywhere is extremely busy and you have to be very patient if you want to get to the front for a good view. Then there are annoying BBC camera crews everywhere, trailing cables and little trucks that knock lumps off your ankles, holding up tapes to stop you getting through and sending you sideways with enormous jibs for that oh-so essential overhead shot. BUT you can’t feel the atmosphere on tv and you can’t smell the Pavilion when it’s full of thousands of flowers, like the newly-launched David Austin rose ‘Emily Bronte’, which has the most wonderful scent. At the Show, you can talk to the growers, the designers and the people who produce all those sundries you’ve heard of and seen in magazines, like Gold Leaf Gloves. 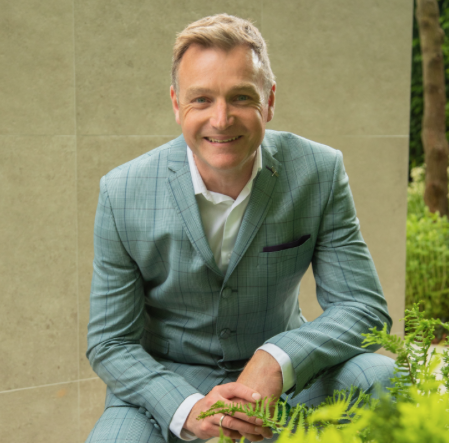 Looking at the gardens in person, you can see why Chris Beardshaw (below) is such a people’s favourite: he plants like we do (or would, if we had free rein and lots of space). This year, he took Gold and Best in Show. 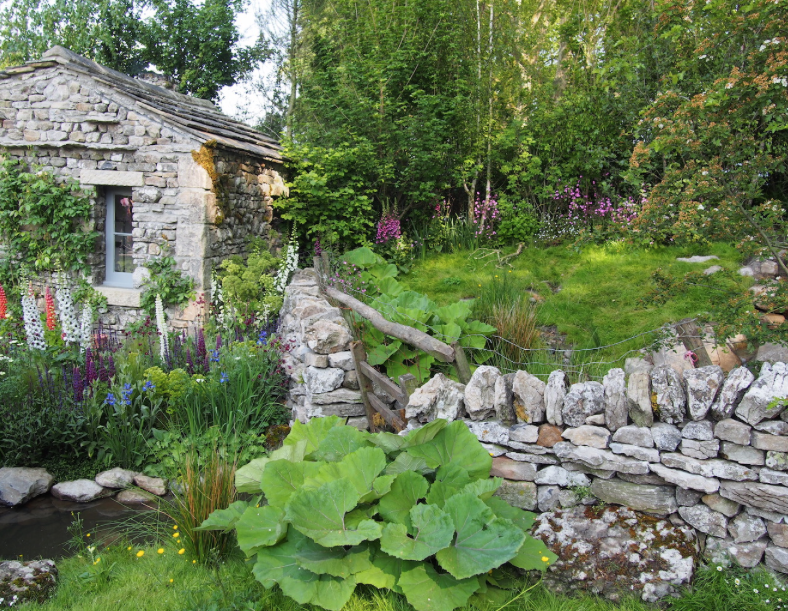 The Welcome to Yorkshire garden (main) has been created by Mark Gregory with such minute attention to detail that you have to keep reminding yourself it’s not real. Stone walls, creaking gate, worn footpath and all. 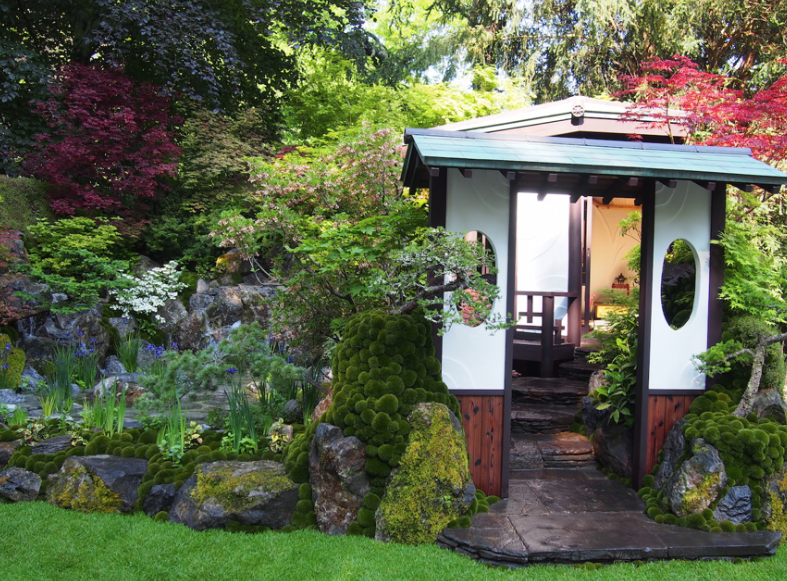 It richly deserved the Peoples’ Choice Gold Award for a Show Garden. This attention is crucial in the smaller gardens, where there’s nowhere to hide. 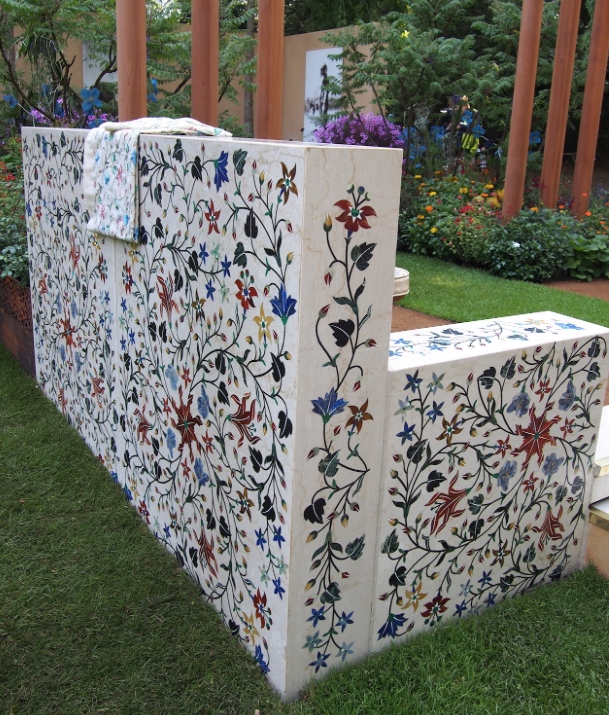 The planting in Kazuyki Ishihara’s Hospitality Garden and Paul Hervey-Brookes’ Viking Cruises Wellness Gardens was impressive and the beautiful inlaid wall (parchinkari) in Sarah Eberle’s British Council Garden was worth a medal on it’s own. Many familiar names were missing from the Great Pavilion this year, for a variety of reasons. Some exhibitors are getting older and no longer want to carry on, others are finding they are too busy with online and mail order sales to spend time away from the nursery. The Show is the poorer for it, even though the RHS try gamely to disguise the gaps with gardens and stands of their own. You can’t help thinking that things would be better if the BBC got rid of their obsession with talking heads and actually showed (and named, so we could write them down) more plants. Growers and breeders are the people to speak to when it comes to knowing what’s on the exhibit and how to care for it, but it takes an experienced grower to talk to them and coax the information from people who are unfamiliar with being on camera. Come on RHS, have a word! If you want to see how it used to be done, watch this BBC Chelsea Programme from 1988 with Peter Seabrook as presenter.